A rabbit that lives indoors is missing out on more than muddied paws and fresh grass, according to a new study by University of Illinois at Urbana-Champaign veterinarians. 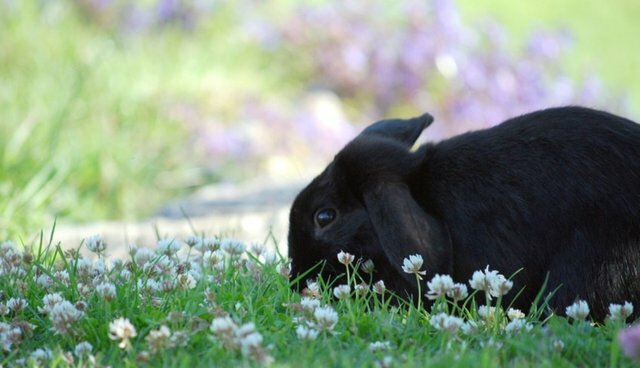 To stay healthy, a bunny needs to spend some time in the sun -- or at least catch a few UV rays. When veterinary professor Mark Mitchell and his colleagues evaluated nine rabbits kept inside, the researchers found that the animals had low vitamin D. But after two weeks of exposure to artificial ultraviolet light, the bunnies' vitamin levels doubled to healthier amounts. Rabbits that don't get enough sunlight face "several types of diseases that can develop with vitamin D deficiency," Mitchell states. He frequently encounters rabbits with tooth and bone problems -- issues associated with too-little vitamin D.
Rabbit owners may be reluctant to let their pets outside due to potential threats like predators or parasites. But keeping a rabbit permanently indoors comes with its own problems. Windows block the type of ultraviolet light that triggers vitamin D production, and a rabbit's diet doesn't always provide enough of the nutrient. "In human medicine, they're starting to measure vitamin D levels as part of our routine medical exams," Mitchell says. That's because vitamin D deficiency in humans is linked to cardiovascular disease, poor cognition and cancer (although the connection between vitamin D and depression remains murky). Helping rabbits get the right amount of vitamin D, Mitchell says, will contribute to "longer, higher quality of life" for pets, too.